GET $500 Off Your next basement remodel! Special Limited Time Offer on your next Basement Remodeling Project with Smartland! Call now or fill out the form on the right and use the promo code "BRP-500-OFF" to get $500 off your next basement remodeling project with Smartland. Don't let the finished basement of your dreams be delayed any longer, ask your Smartland representative about our new unbeatable financing options and get your project in motion! At Smartland, we’ve remodeled basements all across Cleveland and Northeast Ohio, helping our clients add beautiful custom basement finishing that become the center of their social engagements or private retreats that feel like vacation lodges. It’s no wonder why we’re Cleveland’s best basement remodeling company. Many basements suffer from moisture problems. In properly done remodeled basements, waterproofing takes precedence. An interior waterproofing company can determine the cause and correct the situation before construction begins. Mold and mildew present another big problem. That’s why our staff — who are experts in remodeled basements — eschew the use of conventional wood framing, MDF, and drywall in favor of waterproof and fungus-resistant materials. Another issue in a basement remodel is often a lack of natural light. To compensate for this, many remodeled basements incorporate perimeter lighting, spotlights, and wall washers fitted with daylight bulbs that give you the light you need with a flair that goes beyond the obvious solution of recessed high hats in a dropped ceiling. Also, HVAC ductwork and overhead pipes frequently impinge upon valuable headroom. Soffits are commonly used in remodeled basements to cover exposed beams and ductwork. However, if doing so would excessively lower the ceiling, it may be possible to replace existing ducts with a wider, flatter variety to eat up less space. Finally, you need to ensure safety comes first. Remodeled basements should include the installation of GFI receptacles as well as smoke and carbon monoxide detectors. It’s also essential to provide outside combustion for the furnace or boiler, and an emergency window well for easy escape. Remodeled basements offer, on average, at least 800 square feet of living space. In many homes, this unfinished basement space is wasted, but we help you conceive, design and craft a finished basement space that matches the modern look and feel of the rest of your home. This new space can be anything from a craft room for the kids to a room where you entertain guests. Within a few short weeks, your home can feel brand new with a custom layout and design that increases your usable space. Finishing your basement offers a great way to enhance your home and add space without the work and costs of a full addition. The basic structure is already there, as are the required utilities, meaning the extra space you and your family need to spread out can be finished to your specifications in almost no time. Remodeling your basement will take your home to the next level, and help turn your dream home into reality. Once you see the joy in the eyes of your kids, guests, and family, you’ll wonder how you ever lived without it. 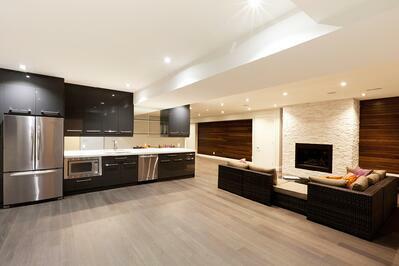 Contact us today and let our basement design-build experts turn your wasted basement space into something amazing. 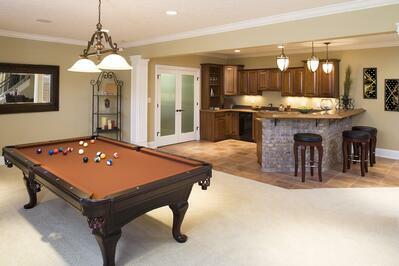 You’ll see why we’re Cleveland and Northeast Ohio’s top basement remodeling company.